This military thriller blurs the line between real-world events and fictional action. John Witzel’s Saving Vengeance is a supercharged political and military thriller that has a firm grip on the pulse of international politics. Here, the ancient desire for personal revenge and retribution is set amid a world of religious terrorism in the Middle East, drone strikes, and interagency fighting in Washington. Rob Madden, a former Special Forces operator with the US military, gets a heart-wrenching phone call from DEA Special Agent Bonnie McCord that brings him back into the world of high-stakes drone strikes and HVT kills. Madden is an veteran of the “dirty wars,” and the government needs him to complete a near-impossible mission involving Yemen’s oil fields. For Madden, returning to his old haunt is personal: his wife and young daughters were killed by Yemeni terrorists two years earlier. The book is set in 2009, prior to the days of ISIS and Yemen’s civil war. Even then, the country was at war with itself, and al-Qaeda was the most feared and successful terrorist organization in the Arab peninsula. Madden operates in this chaotic world, and his mission gets that much harder thanks to FBI and CIA agents who are not necessarily working for the red, white, and blue. Madden is a familiar tragic action hero with a tortured past. He is always trying to do the right thing, but American bureaucracy and evil-minded terrorists prevent him from playing by the rules. Madden and McCord make for a great team: both are renegades who operate from within the government’s web. The novel is riddled with in-depth information about America’s special operations community, the Air Force’s drone program, and how various agencies—including the FBI, CIA, and DEA—combat drug and human trafficking where they intersect with terrorist violence. It also tackles the close relationship between private enterprises and American foreign policy. It is this latter plot point, involving American- and British-owned oil fields in Yemen, that proves most eye-opening. Told in short and sharp chapters that are based around believable dialogue, this political thriller wastes no space. Its descriptions get right to the point, and each plot twist pushes the action forward. Madden and McCord are the types of characters who make for great series reading, and by all indications that is exactly what fans can expect going forward. 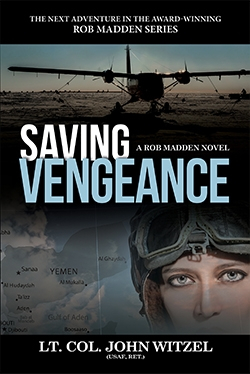 Saving Vengeance is a genre-familiar military thriller that blurs the line between real-world events and fictional action.